The Festa Jaune is a bright, colorful and hot new addition to the Mini PRO line-up. It runs on the new aerodynamically-advanced MA chassis, and features a modern supercar-style body complete with low and wide form, front air intakes, minimalistic cockpit and rear wing. 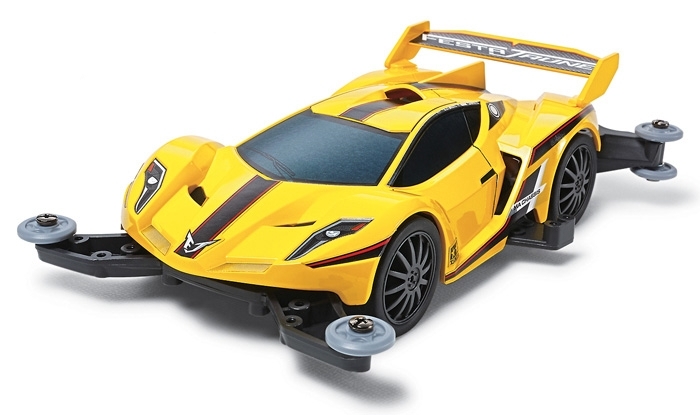 Jaune means "yellow" in French, which is clearly why this new Mini 4WD racer bears the name. Special Feature 1 Length: 156mm, Width: 97mm. Special Feature 2 The MA chassis is molded in Gray ABS. Special Feature 3 A Parts are molded in Light Gray. Special Feature 4 Dark Silver wheels are mounted with Black 26mm low-profile tires. Special Feature 5 The model features a 3.5:1 gear ratio.